As the Brain Thief robot’s motivations become clear, so too is the realization that the liquid metal organism cannot be stopped. 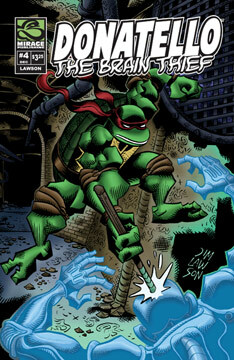 Donatello must not only accept this, he also has to struggle with aspects of his own secretive, dark nature. All attempts to stop the Brain Thief from reuniting with Baxter have so thus far failed. What can Don do, faced with these cold realities?